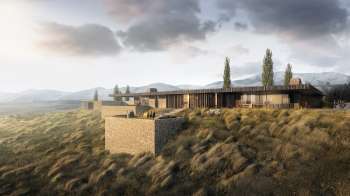 Planning approval sought for new $30 million golf estate in Arrowtown. A long touted golf estate planned for Arrowtown in Central Otago is a step closer to reality, with resource consent being officially applied for by the developers. The Scene.co.nz website is reporting, that local Queenstowner Sir John Davies and his son Michael have applied for consent to build an 18-hole Greg Turner-designed golf course as well as a clubhouse, practice facility and 96 home sites on a 132-Hectare block of land bordered by Hogan’s Gully Road and McDonnell Roads. Described by Turner as “dramatic and, in places, more rugged than its golf course neighbours” the Hogans Gully site is little more than a couple of solid woods from both the charming Arrowtown Golf Club and the new par three course at The Hills Golf Club. The developers currently control numerous skifields on the South Island of New Zealand, and part own the bungy company AJ Hackett. It’s believed that the Hogans Gully project would be their first in golf. Local media are reporting that the Davies’ have previously supported the NZ Open as a tournament sponsor, and that organisers are expected to consider the course as a co-host venue when complete. According to Scene.co.nz the developers are hoping for a hearing on resource consent in August, and if successful will begin construction of the golf course next year. Assisting as a project consultant is American Ryan Brandeburg, the former director of golf at both Kauri Cliffs and Cape Kidnappers. Brandeburg is the current Executive Director of Golf Tourism New Zealand and expected to help with both the delivery and operation of a world-class facility. Planning is in full swing for a $30 million world-class golf resort near Arrowtown. Hogans Gully Farm Ltd has applied for resource consent for an 18-hole championship course, clubhouse, practice facility and 96 homes on a 132-hectare plot bordered by Hogan's Gully Road, McDonnell Rd and State Highway 6. Arrowtown-based ex-golf pro Greg Turner, who's designed the course along with Queenstown's Baxter Design Group, says it will have a different look and feel to the courses that have put Queenstown on the golf tourism map. "The site is rugged, and the golf course will blend in rather than stand out. "We will use the site's natural features, especially the abundance of schist, to create a very unique golf course." The application says it'll "look as if it was created by the hand of Mother Nature". Before finalising his design, Turner says he produced 20 to 30 versions, dating back to 2007. "I've spent literally hundreds of hours out there, wandering around. "I've introduced myself to every rabbit." While challenging enough for pros, it's also designed "for the average Joe", he says. With very little long grass, "it gives the shorter hitters a much better chance". He points out the course will also stand out from others for the scope of its golf practice facility, featuring the latest in technology, and plans for an academy for aspiring pros around NZ. There'll also be a stunning but low-scale clubhouse, including golf shop and gym, designed by Auckland architect Andrew Patterson to resemble a low farm wall. Patterson designed The Hills' award-winning clubhouse and New Plymouth's international Len Lye Centre.